Its a typical Tamil breakfast and with coconut chutney it tastes divine. I make this often at home and for Pongal (Lohri) its a must for nayvedyam...don't ask me why, what. Please. 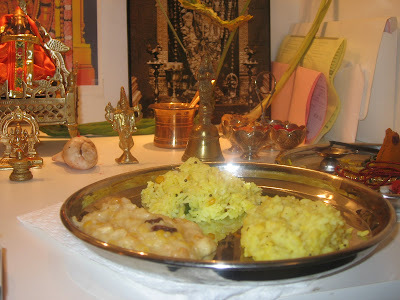 Picture taken in my pooja shelf on Pongal (Jan 2011). I also made sweet pongal that day. I will update the recipe sometime later. Heat 1 tbsp of ghee in a big pan (enough and more to contain 6 cups of water). Wash the rice and moong dal and fry for about 3-5 minutes, stir constantly. Now add the salt, turmeric and stir again. Add 6 cups of water (I use hot water to save time) and cook the rice. By the time the 6 cups of water is gone, pongal would have have been over-cooked (just the way its supposed to be). Make sure to stir the rice once in a while (once in 5 minutes). You can also pressure cook this. If you are pressure cooking, It shoudnt take more than 20 minutes on medium flame. Switch off the stove. In another small tadka pan, heat the remaining ghee and add one by one the ingredients in "tempering". After a minute, add these to the rice and mix well.